Seven Years in Tibet is a 1997 American biographical war drama film based on the 1952 book of the same name written by Austrian mountaineer Heinrich Harrer on his experiences in Tibet between 1944 and 1951 during World War II, the interim period, and the Chinese People's Liberation Army's invasion of Tibet in 1950. 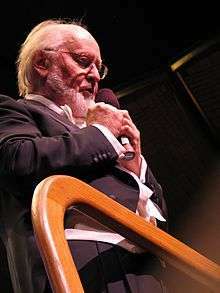 Directed by Jean-Jacques Annaud and starring Brad Pitt and David Thewlis, the score was composed by John Williams and features cellist Yo-Yo Ma. In the story, Austrians Heinrich Harrer (Pitt) and Peter Aufschnaiter (Thewlis) are mountaineering in British India in an area that is now Pakistan. When World War II begins in 1939, their German citizenship results in their imprisonment by the British in a POW camp in Dehradun in the Himalayan foothills, in the present-day Indian state of Uttarakhand. In 1944, Harrer and Aufschnaiter escape the prison, and cross the border into Tibet, traversing the treacherous high plateau. While in Tibet, after initially being ordered to return to India, they are welcomed at the holy city of Lhasa, and become absorbed into an unfamiliar way of life. Harrer is introduced to the 14th Dalai Lama, who is still a boy, and becomes one of his tutors. During their time together, Heinrich becomes a close friend to the young spiritual leader. Harrer and Aufschnaiter stay in the country until the Chinese military campaign in 1950. Austrian mountaineers Heinrich Harrer (Pitt) and Peter Aufschnaiter (Thewlis) are part of a team attempting to summit Nanga Parbat in British India (present-day Pakistan). When World War II begins in 1939, they are arrested by British Indian authorities and imprisoned in a POW camp in Dehradun in the Himalayan foothills, in the present-day Indian state of Uttarakhand. Harrer's pregnant wife, Ingrid, sends him divorce papers from Austria. In 1944, Harrer and Aufschnaiter escape the prison and cross into Tibet. After being initially rejected by the isolated nation, they manage to travel in disguise to the Tibetan capital city of Lhasa. There, they become the house guests of Tibetan diplomat Kungo Tsarong (Mako). The Tibetan senior official Ngawang Jigme (Wong) also extends friendship to the two foreigners with gifts of custom-made Western suits. Aufschnaiter falls in love with the tailor, Pema Lhaki, and marries her. In 1945, Harrer plans to return to Austria. However, he receives a cold letter from his son, rejecting Harrer as his father, and this deters him from leaving Tibet. Soon afterwards, Harrer is invited to the Potala Palace and becomes the 14th Dalai Lama's tutor in world geography, science, and Western culture. Meanwhile, political relations with China sour as they make plans to invade Tibet. Ngawang Jigme leads the Tibetan army at the border town of Chamdo to halt the advancing People's Liberation Army. However, Ngawang Jigme ends up surrendering and blows up the Tibetan ammunition dump after the one-sided Battle of Chamdo. During the treaty signing, Kungo Tsarong tells Harrer that if Jigme had not destroyed the weapons supply the Tibetan guerrillas could have held the mountain passes long enough to appeal to other nations for help. As the Chinese invade and occupy Tibet, Harrer shames Ngawang Jigme for betraying his country. Harrer returns the jacket that Ngawang Jigme gave him as a present, which is a grave insult in Tibetan culture. Harrer tries to convince the Dalai Lama to flee, but he refuses. The Dalai Lama encourages Harrer to return to Austria and be a father to his son. After the coronation ceremony, in which the Dalai Lama is formally enthroned as the spiritual and temporal leader of Tibet, Harrer returns to Austria in 1951. Rolf refuses to meet Harrer at first, but Harrer leaves a music box that the Dalai Lama gave him and this piques Rolf's interest. Years later, Harrer and Rolf are seen mountain-climbing together, suggesting they have mended their relationship at the end of the film. Most of the shooting took place in Argentina, in the city of La Plata (the railway station where Heinrich leaves for Unserberg is the Main Train Station of La Plata, for example), and in the Mendoza Province, in such places as the Andes mountains. Some time after the film's release, director Annaud confirmed that two crews secretly shot footage for the film in Tibet, amounting to approximately 20 minutes of footage in the final film. Other footage was shot in Nepal, Austria and Canada. There are a number of significant differences between the book and the film. In the film, Harrer is hailed as a 'German hero', and replies "Thank you, but I'm Austrian". To have said that in 1939 would have been extremely bold, since Austria had been part of Greater Germany since the Anschluss of April 1938. In the book, Harrer says nothing about any such remark. Harrer at the train station in 1939 appears hostile to the Nazi Party, taking their flag with reluctance. The real-life Heinrich Harrer was in fact a committed Nazi Schutzstaffel (S.S.) NCO. The film makes his son a key theme, but in the book, Harrer does not mention his wife or son. He had in fact been married and divorced, as the film shows, but his ex-wife's new husband was killed in the war and Harrer's son was raised by his ex-wife's mother. In his autobiography, Harrer gives details of his contact with his son, but nothing to support what the film shows. In the book, Harrer says there was little to tie him to home as one of the reasons for staying in Tibet and not returning to Europe. The pre-invasion visit of Chinese Communist negotiators to Lhasa, arriving at an airfield constructed by Tibetans, and their departure for China after a brief conference with their Tibetan counterparts—including the desecration of the sand mandala as well as the "religion is poison" remark as depicted in the film, do not occur in the book or in any of the numerous histories that have been written about the matter. There was no air link until Lhasa Gonggar Airport was constructed in 1956—when the Dalai Lama visited Beijing in 1954, he used the still-incomplete road system. The whole sequence of negotiations and the installation of the Dalai Lama as ruler are out of sequence. Tenzin Gyatso, 14th Dalai Lama was enthroned as the temporal leader of Tibet on 17 November 1950. After the Chinese crossed the Jinsha River and defeated the Tibetan army in October 1950, a Tibetan delegation was sent to Beijing and agreed on the Seventeen Point Agreement for the Peaceful Liberation of Tibet. Meanwhile, the Dalai Lama left Lhasa and took refuge on the border with India and Sikkim. The Dalai Lama disliked the agreement. He returned to Lhasa, and for several years tried to work within its terms. Seven Years in Tibet premiered on September 13, 1997 at the 1997 Toronto International Film Festival before a commercial release on October 8, 1997 in the United States and Canada, distributed to 2,103 theaters for its domestic opening weekend. After its run, the film grossed $37,957,682 domestically and $93,500,000 overseas with an overall box office gross of $131,457,682. Based on 33 reviews collected by Rotten Tomatoes, the film received a 61% approval rating from critics, with an average score of 6.3/10. Metacritic, which assigns a normalized rating in the 0–100 range based on reviews from top mainstream critics, calculated an average score of 55, based on 18 reviews. Roger Ebert of the Chicago Sun-Times acclaimed the film in general, stating that "Seven Years in Tibet is an ambitious and beautiful movie with much to interest the patient viewer, but it makes the common mistake of many films about travelers and explorers: It is more concerned with their adventures than with what they discover. Additionally, Ebert believed the film was told from the perspective of the wrong character and thought the casting of Pitt and Thewlis should have been reversed. Derek Elley of Variety praised the film's overall production value but thought: "for a story with all the potential of a sweeping emotional drama set in great locations, too often you just long for the pic to cut loose from the ethnography and correct attitudes and go with the drama in old Hollywood style." As the film was being released, it was condemned by the government of the People's Republic of China, which stated that Communist Chinese military officers were intentionally shown as rude and arrogant, brutalizing the local people. The Chinese government also decried the film's positive portrayal of the 14th Dalai Lama. Director Jean-Jacques Annaud and stars Brad Pitt and David Thewlis were banned from ever entering China. Annaud has since been welcomed back to China with open arms in 2012 to chair the jury of the 15th annual Shanghai International Film Festival. Also in dispute is the use of the terms "Chinese Embassy in Tibet" and "occupation of Tibet", in view of the Tibetan sovereignty debate. Kundun, another 1997 film depicting the Dalai Lama during his youth. ↑ "SEVEN YEARS IN TIBET (PG)". British Board of Film Classification. October 21, 1997. Retrieved January 3, 2015. 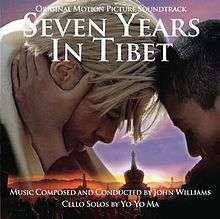 1 2 "Seven Years in Tibet (1997)". Box Office Mojo. IMDb. Retrieved September 12, 2012. ↑ Shirer, William L., The Rise and Fall of the Third Reich, Chapter 13. Shirer says of the plebiscite "it took a very brave Austrian to vote No". ↑ Weinraub, Bernard (June 21, 1997). "Dalai Lama's Tutor, Portrayed by Brad Pitt, Wasn't Just Roving Through the Himalayas". The New York Times. ↑ Shakya, Tsering. The Dragon In The Land Of Snows. (1999). Columbia University Press. ISBN 0-231-11814-7. pp. 32-45. 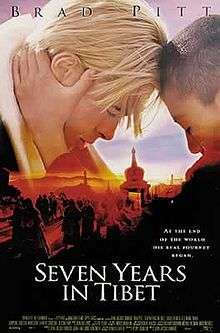 ↑ "Seven Years in Tibet Movie Reviews". Rotten Tomatoes. Flixster. Retrieved September 12, 2012. ↑ "Seven Years in Tibet (1997): Reviews". Metacritic. CNET Networks. Retrieved September 12, 2012. ↑ Roger Ebert (October 10, 1997). "Seven Years in Tibet :: rogerebert.com :: Reviews". Chicago Sun-Times. Retrieved September 12, 2012. ↑ Derek Elley (September 27, 1997). "Variety Reviews - Seven Years in Tibet - Film Reviews -- Review by Derek Elley". Variety. Retrieved September 12, 2012. ↑ Canada Tibet Committee: "Hollywood's New China Syndrome (The Los Angeles Times) 'Red Corner,' 'Seven Years in Tibet' and 'Kundun' take the country's human rights record to task, especially regarding its treatment of Tibet. How will the Chinese react to filmdom's scrutiny?" ↑ Jonathan Landreth (June 15, 2012). "Shanghai Film Fest: Q&A with director Jean-Jacques Annaud". Los Angeles Times. Tribune Company. Retrieved September 11, 2012.